Get the best custom display packaging from Refine packaging. 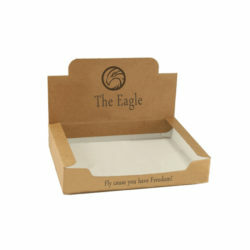 We produce great quality display boxes that will surely grab your customer's attention. Moreover, we offer complete customization and make sure all your requirements are fulfilled. We produce custom boxes in all shapes and sizes. Whether you want a rectangle or a circle we will manufacture it for you. Besides, making the size and shape of the box to your liking we also offer customization in the design of the box. You design the imprints to be printed on the box and we imitate the design exactly the same on your box. However, may you fail to develop a unique intriguing design our team will help you free of cost. To make the box stand out you can also ask us to add different ornaments like ribbons, bows to the box or any other ornament that goes with your product. Also, we make sure that high quality material is used to make the boxes so that the boxes are reliable and protect your product from squishing. Moreover, at refine packaging you place an order of a minimum of 100 boxes and a maximum of 500,000 boxes. Mostly we take around 6 to 8 business days to deliver your order. But if want it sooner than the standard delivery time we will supply it immediately. 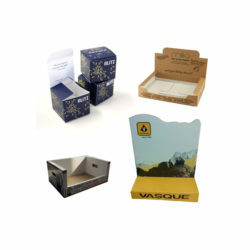 So, rush to RefinePackaging.com to get the best display boxes for your product.